Apple Wants Customers to See iPad Pro as Laptop Replacement. But Customers Say No. We have been repeatedly told, by Apple of course, all we need is an iPad Pro with its keyboard and $150 Pencil. The perfect laptop replacement. Are the customers seeing it the same way? One way to find this is by looking at the change in iPad Average Selling Price (ASP) due to iPad Pro. Since the regular iPad starts at a list price of $329, less than half of starting list price of $799 for $iPad Pro, you would expect an upward shift in ASP if there is higher percentage of iPad Pro in the sales. Here is the chart on the history of iPad unit sales and ASP since its inception in 2010. First fiscal quarter 2016 was the first full quarter iPad Pro was on sale since its introduction in September 2015. Back then, before Apple announced its results I predicted they would sell 20 million units for that Holidays quarter with 2 million of them pricey iPad Pro. I was overly optimistic in that prediction. Apple sold a total of 16.1 million iPads. The ASP was $452 compared to $415 in the quarter it did not have pricey iPad Pro. Since that initial jump of 10%, iPad ASP has stayed steady over the next six quarters. 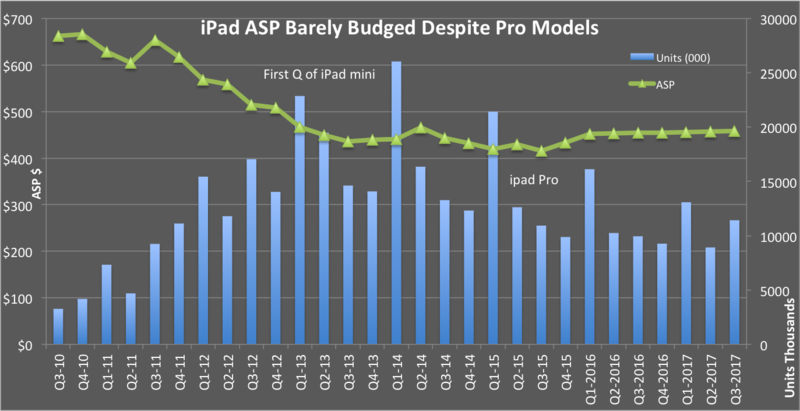 If we were to see increasing mix of iPAd Pro we should see an increasing ASP trend. We don’t. There is increase in unit sales but not commensurate increase in revenue. For instance in the most recent quarter, iPad sales increased 15% but the revenue increased only 2%. Macs on the other hand produced 7% incease in revenue with just 1% increase in unit sales. Which means, try as it may, customers are not buying the pricey iPad Pro and not seeing it as laptop replacement. iPad ASP at this point may have hit the ceiling for Apple. Fitbit reported its 2017 second quarter earnings last week. Sales were down year over year and losses continue but lower than expected loss and its guidance for future breakeven made the investors bid up the stock. The day after they reported, the stock went up 15% but gave up a third of that gain the next day. I am not a chartist but it is hard to miss this up and down trading pattern we have seen with share price over the past eight quarters. I first wrote about Fitbit’s lack of product market fit. It boils down to the basic tenets of marketing – who is the customer, why are they buying and what budget are they paying for it. This was my analysis as a marketer. As an individual who is into fitness, eating right and measuring I also find fundamental problems with the claims like the focus on 10,000 steps. I also do not see their claims on healthcare benefits in their reported studies as defensible. And I am neither long or short on the stock. Now that we got that out of the way, I want you to take a closer look at the reported numbers to see if there is indeed some spring in its step. The data for these charts come from the company reports, they are indeed incredibly transparent in reporting many such metrics that you otherwise may not see in many other reports. The first chart is the reported percentage of returning vs. new customers in their unit sales. This is the last six quarters data on the percentage of sales to returning customers. As you notice a 40-60 split between returning and new customers. This does not look bad as businesses grow by finding and adding new customers. Except Fitbit has been known to boast its 90% market share and the number one position in wearables space (at least until last quarter). As I said, this is expected when sales are growin, which brings us to second chart. The unit sales are not growing. As they significantly cut marketing spend, the sales dropped. There is no inherent momentum or power of installed base that is carrying the sales forward. Finally to add a different aspect to this concern I present the third chart which shows what percentage of past customers are returning. 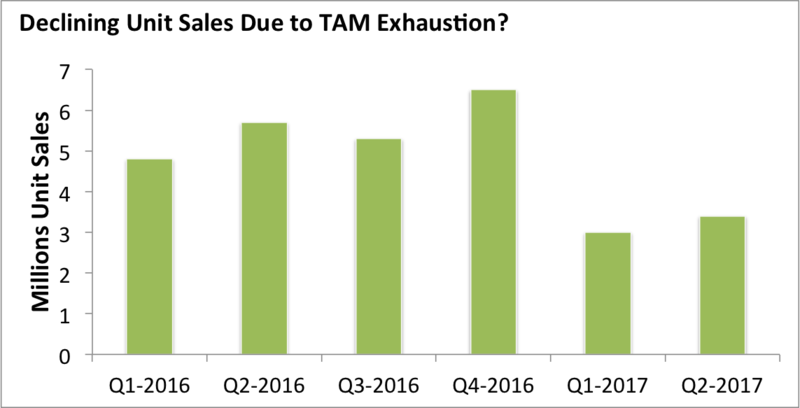 This assumes a 12-month refresh cycle and calculates the share of current sales were to those upgrading. This is an important metric on customer retention and reducing future marketing expenses for customer acquisition. More importantly, this is also an indication of product delivering on its value promise. For better comparison, I overlay this 12-month upgrade percentage to chart 1. As you can see this number is dropping significantly. 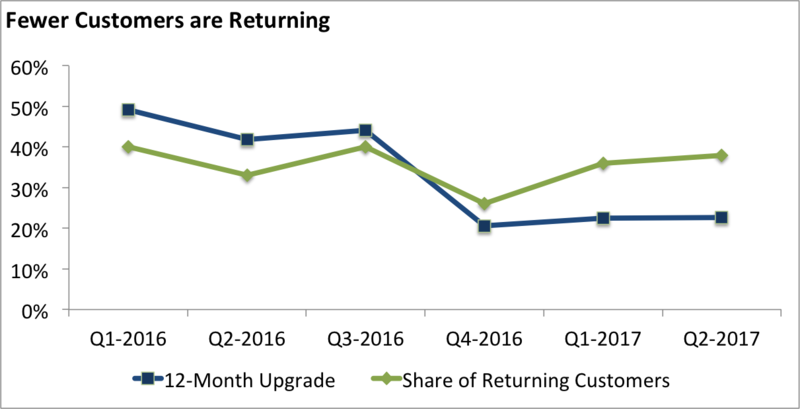 For the past 3 quarters less than one in five of past customers who bought a device 12 months before that period are coming back. There is no loyalty or stickiness. Given that their sales have considerably dropped in the past four quarters, the low returning rate points to smaller and smaller contribution to future sales meaning the need to find new customers at higher cost. At this point everyone who wants a Fitbit device in their sock closet have one. And anyone who wants a $300 smart watch would rather buy third generation products from Apple, Samsung, Garmin and the rest. It appears not many steps left to take. I have written over years on the pricing excellence of Apple, a well executed and repeatable strategy across its entire product line. You should look at my writings on price fencing, iMac pricing, MacBook pricing, iPad pricing, and of course iPhone Pricing. Yet there is plenty of evidence that those who say that price is untenable will be eating crow come fall. As someone who has eaten crow a few times, I couch my statements in likelihoods, nevertheless evidence points (shall we say Bayesian reasoning?) $1000 to $1400 phones. However, I differ from the WSJ piece on four (four and a half actually) out of five reasons stated in that article. TLDR: there is only one reason. Before we get there, let us start with the business goal for Apple. Afterall you start with your business goals before you touch pricing, don’t you? Number one goal of any real business is growing profit. All the more true for a business that is $140 billion a year like the iPhone. What are the profit growth levers Apple has to pull? The same everyone has, grow revenue or reduce cost. Moment’s reflection will convince you growing revenue is a better and limitless lever so let us just focus on that. Revenue is price times unit volume. iPhone is no small business. Apple sells about 211 million iPhones a year, that is 7 iPhones a second. It has sales worldwide. How much more growth in unit sales can it produce? It is struggling in India and faces challenges in China. Yes, it can solve these two big markets to drive more unit sales. This is going to be a long-haul effort, not something Apple can solve in a year. So that leaves price. But you can’t increase pricing and expect customers to keep paying for it. Apple will follow its time tested repeatable playbook – product versioning. Define the right mix of product features, erect price fences, and let customers willingly self-select to the version they want to pay. Today the highest price point for iPhone 7s is $969 for 256GB Plus version. The lowest price point is for $399 for 32GB iPhone SE. After channel pricing and other factors, we see the average selling price (average across all its models) is a tad less than $700. There exists a segment that finds $399 too high for iPhone and will gladly buy at lower price point. The second segment is not interesting to Apple. Only the first segment is interesting. That is simply the case why you will see a $1000-$1400 price point for iPhone8. This is not a new concept. This is price discrimination, to be exact, Second Degree price discrimination, introduced by economist Pigou. A standard iPhone 8 that is marginally better than iPhone 7s at current $649 price point. And bigger(? ), better and cooler models at $1000-$1400 price points. So where do I deviate from the WSJ piece? I believe the stated reason above – the need for profit growth based on standard economic theory and product design – alone is enough for making a case for $1400 iPhone. I would go on to say that is the only reason and nothing else. Perhaps this is because my thoughts are colored by the practitioner glasses I wear. Boosting the Brand: It is already the most valuable brand, what more it can do or what does that mean to profit growth? 211 millions buy iPhones today, a $1400 is not going to attract more as stated in the article. Crazy New Tech I disagree because based on track record Apple does not give any more than what is absolutely needed despite its cost to deliver it. See my past articles on Retina screen on MacBook Air and earbuds. Supplies are limited Perhaps, but that is a product design decision and more importantly, the segment that values these features enough to pay a premium is limited too. Flip the question on its head, if a very large segment is willing to pay $1400 for these features won’t you think Apple would solve the supply chain problem? Or raise prices even more? All about the ASP This I agree. The half I do not agree is it needs to be based on business goal (which I said before is profit growth). $$$$ = Desire This I strongly disagree. Mims states here that higher price point will make more covet the product. This is the notion of Veblen goods (conspicuous consumption anyone?). We are talking about a product that sells at the rate of 7 per second. This is no coveted product. $649 for a phone, while you can $99 is already a luxury price point. There are not enough ways to make the $1400 conspicuous enough for this factor to apply. How many bought the $10,000 Vertu phone because of its price? I have also not seen a product’s demand behaves like Veblen good beyond the initial excitement. I think Pigou is the stronger economist here than Veblen. So there you have it. I can see a scenario for a $1400 iPhone 8. And it is only because of Apple’s search for profit growth. Nothing more. Tesla is like Apple in 2007, and the other car makers are Nokia/Blackberry of 2007. Let us lest these arguments and see if there is any verifiable reason beyond a bet on what is possible. Let us fast forward 10 years to 2027. As most compare Tesla to Apple, let us give Tesla the highest market capitalization Apple achieved, $800 billion (for round number). Why only $800 billion, why is it not much higher? It is inconceivable to see a business achieving any larger scale without breaking up (and definitely not in just 10 years). Apple’s market cap was $112 billion in 2007, Tesla’s current market cap is $49 billion (that is we are assuming Apple grew 7X but Tesla would grow 16X). Let us give Tesla at this size a P/E ratio same as Apple, 16. Compare this to P/E ratios of luxury carmakers, BMW 7.6 and Mercedes 6.5. So we are giving a multiple that is more like a tech company than a manufacturing company. At 16 P/E, the total profit is $50 billion. Now to the point on Tesla is more than a Car company. We do not know how the battery business and solar business will play out. So let us assume the split profit is 60% cars, 40% battery plus solar. That is net income from car business at 60% ratio is $30 billion. Compare this to reported total EBIT (Earnings Before Interests and Taxes) of entire car industry of $130 billion. We are talking Tesla taking 25%-35% of industry profit. And this profit is just a tad above Toyota. Now for profit per car. The best reported numbers come from luxury car markers. Porsche is at the top with $17,000. In non-luxury segment trucks make most per vehicle profit of $10,000 to $15,000. Let us say Tesla achieves numbers like these to get $13,000 per car. Not that the best in class operationally efficient Toyota gets $2800 per car. So Tesla is assumed to have perfected operational efficiencies at scale (something it struggles with now) and have a product mix that is all super high profit vehicles. At $15,000 profit per car and $30 billion total profit, we are talking 2 million cars per year. That is less than what any of the top 5 carmakers sell today. So at its peak, with valuations and profit like Apple, Tesla will sell fewer cars than current carmakers and a total profit that is higher than any operational giant. Why should its car business get any different valuation than the best in class now? In other words, even assuming the best case scenario for everything – all lights staying green for Tesla, with no pit stops, no detours, no roadside hazards, no traffic on the road – its valuation seem to be based more on the hope and promise of unknown than on known economics. As a consumer driving our economy, can you explain what does the price you pay for things mean to you? As a business charging customers for products and services, can you explain what the customers are paying you for? It more important for the second category to understand pricing than the first, otherwise there won’t be a viable business to talk about. But more often than not we see failure in not only answering the question but in general in how they set pricing. More businesses do pricing wrong than right. To compound the problem we see incomplete, incorrect and inapt pricing methods from news stories spread around as innovative and panacea. Take for instance a story on food truck pricing from The Washington Post. It is about a food truck selling pizzas with a spin on pricing. You spin a wheel, if you land on 99 cents you pay just 99 cents, if not you pay $9.99. Pricing based on statistical modeling and probability? Let us not get ahead of ourselves. Where do you start for answering the pricing question? You start with the customer segment and what job you want the customer to hire your product for. Let me let you in on a secret, pricing need not be innovative, it just needs to be a share of perceived customer value. Customers who regularly eat out for lunch pay for food truck from lunch budget, customers who try food trucks occasionally pay for it from their entertainment budget. This matters. The gimmick in pricing, with the thrill of scoring a pie for 99 cents may attract a few, for a while. But the initial excitement fades away quickly and it is not an unmet need. There are many options for customers seeking excitement. The product as we read in the story is just ordinary, nothing gourmet about it. 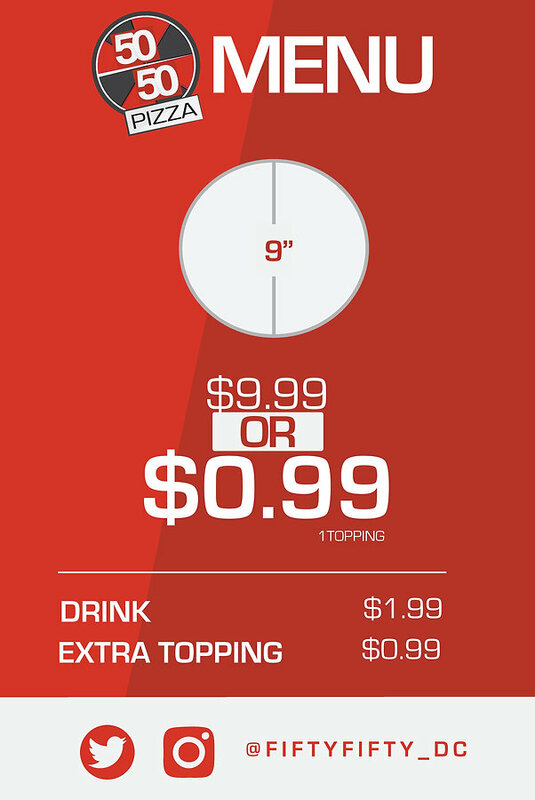 Even at 99 cents, the first bite into the ordinary pizza will be a buzz killer. Imagine the feeling of customer who paid $9.99. The food truck owner was quoted saying he makes a profit on 2 pizzas (one sold at $.99 and the other for $9.99). Be that as it may, there is a complete failure of understanding of customer and in delivering a compelling product. Pricing is being used as a way to attract sales than as a share of value created. How do you do your pricing? Yesterday Apple announces its fiscal Q4 2016 earnings report. As expected iPhone revenues continue to dominate total revenue. And there is one number that every analyst has been tracking, that is derived from reported iPhone revenue and unit sales, the Average Selling Price (ASP). Why is this important number? While the volume of iPhones sold gives an indication to adoption the ASP number tells specifically about the demand for the newly announced iPhone 7 and iPhone 7 Plus models. Take a look at this chart on the history of iPhone ASP over past three years (with the line added to visualize ups and downs). I updated this from my last article to show Q4 numbers and projected 2017 Q1 numbers. As I pointed out last time, the ASP was expected to move up this quarter and next. But did it go up enough past quarter when iPhone7 was available for sale for only a short time and will it go up high enough the current quarter that includes Holiday buying season. Most analyst predictions for the Q1-2017 ASP (issued before the earnings came out) expect $674 to $679 in Q1. Last time Apple had a full version upgrade was from iPhone 5S to iPhone 6 in Q4-2014. Then ASP jumped from a low of $564 in Q2 to $687 in Q1, a 22% jump. The storage capacity of lowest priced iPhone 7 model is 32GB vs. 16GB in iPhone 6 and 6s. This tempted more customers to pick that version even though they could afford to pay for higher capacity. That is more customers see 128GB is too much for their needs to pay $100 more, unlike last time when they saw far more value from 64GB. Apple is trying to mitigate that by allowing Jet Black models only in 128GB and 256GB capacity points. They also increased the price of iPhone 7 Plus by $130 vs. $100 in iPhone 6 Plus. While these two mitigating factors helped, it is a lot more likely that most models sold in Q1 will be the 32GB models, suppressing ASP. Apple set a record $691 ASP in same Q1 last year. This time it is going to come in closer to $640 to $650. It turns out there is such thing as diminishing marginal utility when it comes to iPhone storage capacity.